The Bernese Mountain dog is a devoted family dog who is excellent with children. The origin of the breed can be traced to the Romans' invasion of Switzerland, where army guard dogs mated with local flock guarders. The breed appears to have a higher than average mortality rate from cancer. 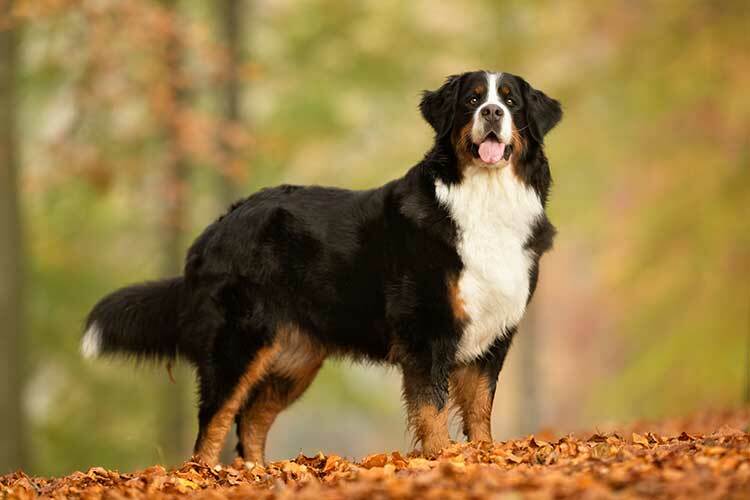 But while their lack of longevity is well known, in general Bernese enjoy happy and comfortable lives. The Bernese Mountain Dog is listed under the Kennel Club hip dysplasia scheme. The average hip score for the breed is 15 (each hip is scored individually, then the two figures added together to give the dog's final hip score). Breeders are strongly advised to only breed from dogs with scores well below this figure. The Bernese is also listed under the Kennel Club elbow dysplasia scheme. To get an elbow score, each elbow is tested and given a score between 0 and 3 (0 being the best and 3 the most severe); the highest being taken as the score for that dog. Breeders should only breed from dogs with a score of 0 or 1. Calm and relaxed, not noisy. Sociable - enjoys company of people and other dogs. A devoted family dog who is excellent with children. Relishes human company and does not enjoy being left alone for long periods. The Bernese enjoys exercise but doesn't need lots of long walks. An hour a day is recommended for an adult dog. Due to the size of an adult Bernese, a large home is advisable. As always, ensure your garden is secure. Bernese are naturally eager to please. The breed has a reputation for not being particularly intelligent, but these dogs are very responsive to treat-based reward training and rapid progress can be made. A Bernese will need a 30-minute brush each week at least to maintain his coat. He also sheds pretty constantly! This is a fast-growing breed so rest is just as important to your puppy as exercise, to ease pressure on growing joints. Can partake in many dog activities. Can be expensive to buy and care for. The origin of the breed can be traced to the Romans' invasion of Switzerland, where army guard dogs mated with local flock guarders. Membership of the Bernese Mountain Dog Club of Great Britain is open to anyone - even those without a dog. Bernese were bred to pull carts all day, and carting is a popular sport with Bernese owners, with many events taking place each year. Special obstacle courses allow the dogs to show off their draughting abilities, often with owners in traditional Swiss outfits.